Day outing or coastal cruising for several days. Berth for one person into the cockpit sheltered by a tarpaulin. Double paddle for in-harbor maneuvers, beaching and leaving the beach, or slow navigation in scenic spots. Sails and rigging, side-boards and rudder can be set up and down during navigation from the cockpit. Ultra light Torqeedo type electric motor, mounted in a center well, can be lowered or raised from cockpit. It is used particularly in dead calm or strong wind conditions. Trailerable with a small car. Camille can also be loaded singlehandedly on top of a station wagon using a patented three-part system. Two removable side wheels can be fastened to hull for carriage from ground to water and back. Buoyancy boxes on stem, stern and under cockpit floor prevent Camille from sinking if flooded. Devices are provided to enable the sailor right the boat if capsized and get back on board. 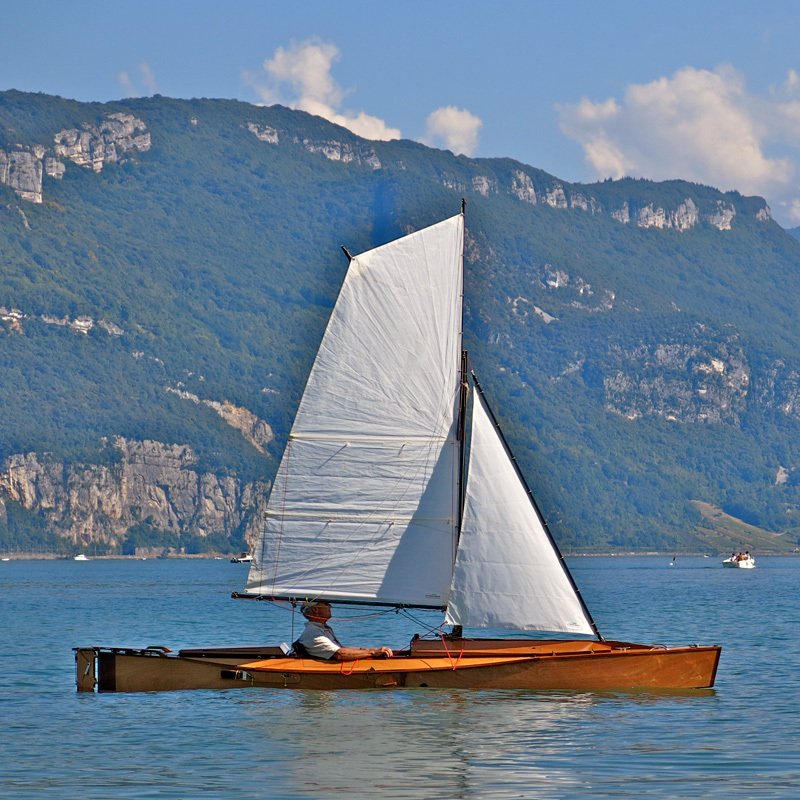 Camille was launched in August 2014 on Lac du Bourget in the French Alps after 3 years of part-time construction. I made the first sketch in August 2005. I was at that time a senior “ground” architect with sailing and kayaking experience on lakes, rivers and coastal areas. I went back to University and earned a Naval Architecture degree from the Ecole Nationale Supérieure d’Architecture de Paris-La Villette in 2010. Camille was designed using PowerCadd and Rhino (3D) software to satisfy my degree requirements. Sea trials under sail proved Camille able to tack close to the wind (less than 100° from tack to tack) and sail at constant speed (maximum of 5,2 knots under archimedean condition) whatever the sail trim. A comfortable multi-position seat and a counterheeling opening in the deck allow the sailor to adjust his (her) position to the type of propulsion.